This page lists a few products that look interesting, useful and unique to me — products I’d never seen before and thought when I first saw them “what a clever idea”. 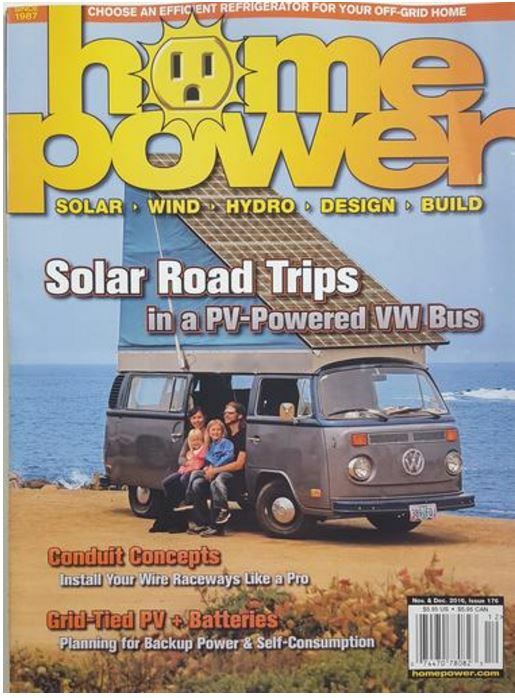 Bret converted a gasoline powered VW van to an electrically powered camper. The van includes a sort of pop top in which the tilt up roof is made from four 305 watt PV panels. 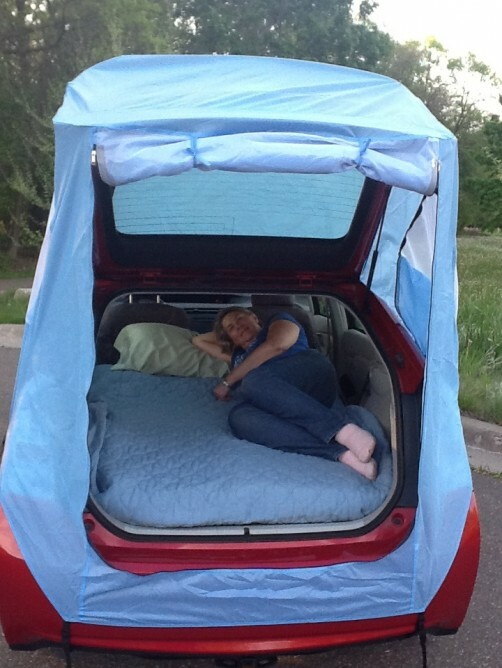 The tilt up top provides for more efficient PV charging and provides a large sleeping area. Amazingly, the total cost of the project (including the used VW) was only $25,510. A planned phase II will go to Lithium batteries that will increase range significantly. There is a very detailed article in the Nov/Dec 2016 issue of Home Power magzine. This article also describes a 1400 mile trip in the van with the whole family of four. Zodi makes some very simple products for getting a hot shower with no electricity or running water. One of them uses what looks like a one of the pressurized can garden sprayers to hold the water and pressurize it. 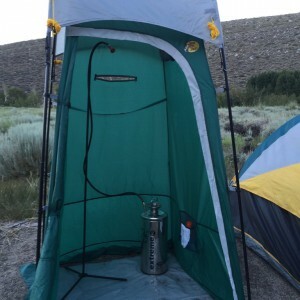 The heater is basically a propane canister powered cook stove and a 6 ft rubber hose delivers the pressurized water to a shower head. Takes about 10 minutes to warm up the water for a shower. Another version is basically a compact version of a instantaneous (tankless) water heater. 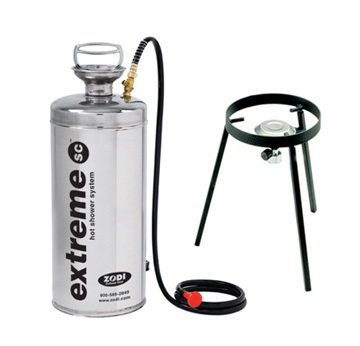 The heat source is a propane canister and a 12 volt pump is used to pump water through the tankless heater for a shower with no wait. They also offer shower tents and other accessories. 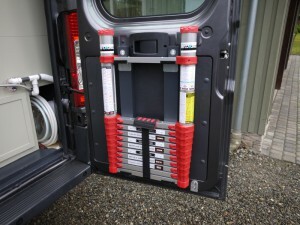 Vans RV conversions are tall, and if you want to be able to get to stuff on the roof or maybe tilt up your roof mounted solar panel, you pretty much need a ladder — but ladders are tough to store. 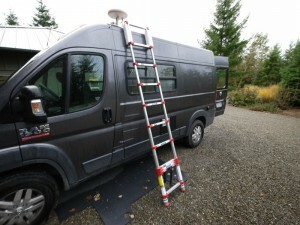 This is a clever telescoping ladder that gets you up on the roof safely, but stows away in a small space. This is a clever, simple, and cheap DIY method to keep drawers from sliding open when you go around corners. 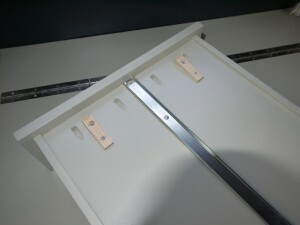 The wood wedges installed on the bottom of the drawers prevent the drawer from opening until the drawer is lifted slightly to clear the wedge.